Damascus, Syria – It seems that the American Firearm Community (AFC) is split on President Trump’s use of Tomahawk missiles in retaliation for a chemical weapons attack that left 86 dead, including 28 children. The AFC has two distinct factions, the evangelical right and the libertarian right and the split appears to be on those lines as well. Leftist firearm owners are not unheard of in the AFC, but are significantly more rare than their right leaning counterparts. The leftists are having a hard time with this as well, trying to decide if they should continue to hate everything that President Trump does or if they should applaud his bombing of a foreign country – a tactic that President Obama was very skilled at. It did not take long for both sides to fire up their MEME MACHINES to get the debate started. 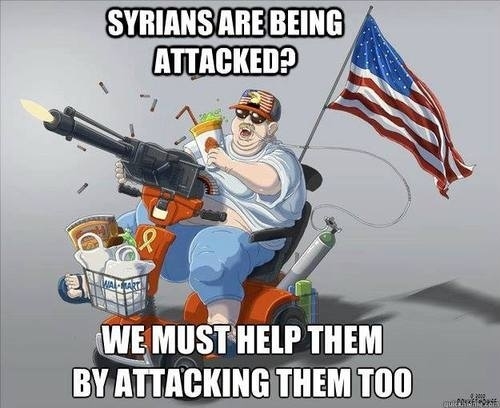 Fashy Goys posted this one – an apparent attack on irrelevant baby boomers that have never met a country that they wouldn’t like to bomb. Freedom Memes posted this in retaliation – seeming to insinuate that President Trump is playing “4-D” chess and is actually thinking three steps ahead! 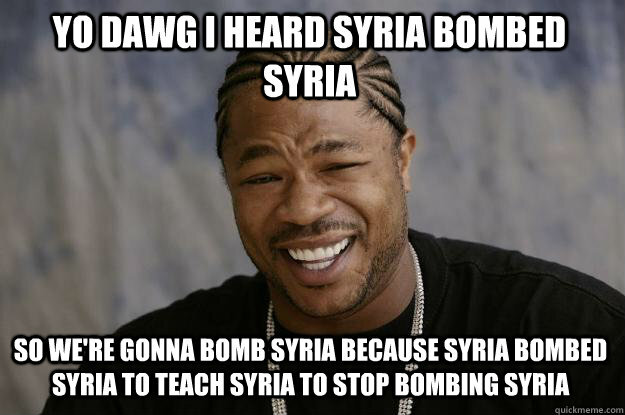 Yo Dawg made an appearance here. 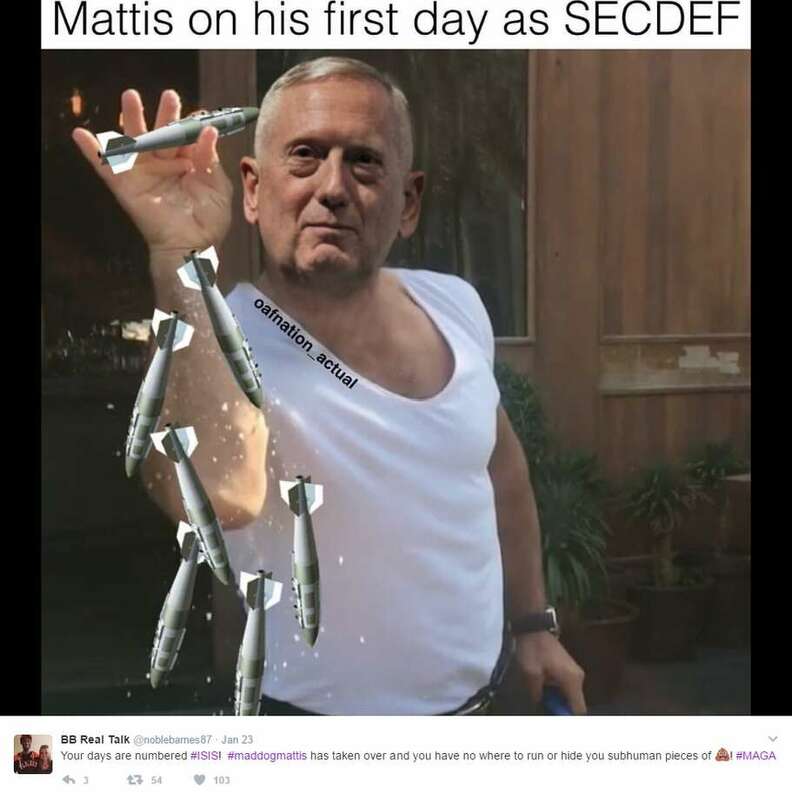 SECDEF Mattis was featured as well – sprinkling cruise missiles in an attempt to “season” the world. Fat American Patriot Riding Hoverround (FAPRH) got into the act. FAPRH doesn’t cotton to dictators bombing innocent children with Sarin gas! Speaking of Sarin, FAPRH’s wife wants to know if it is safe to keep the Sarin Wrap in the kitchen? Will that lead to dead children as well? President Trump made an appearance – coming from as far back as 2013 with these words of wisdom. It is not our place here at THE FEEDRAMP to takes sides in this matter. We are investigative journalists first, satirists second. We don’t know if President Trump did the right thing or the wrong thing. One could point out that all of the bombing and conflict that we’ve been engaged in since 9/11/2001 has brought nothing but peace and tranquility to the world. We could point out that one man’s cruise missile is another man’s Boeing 757 / 767. We might also point out that the esteemed Ron Paul warned against this and all foreign intervention since… well, for a long time. We could do those things, but we are not going to. The important thing is to support your country blindly, right or wrong, because that’s what PATRIOTISM is. It’s also important to buy “defense” stocks ASAP because it looks like the next four years are going to be very similar to the last sixteen. I will leave you with these words of wisdom that I gleaned from Facebook. Apparently the fact that our country is in more debt that can ever be repaid is of no consequence at this point because if committing American Troops and money to some shithole halfway across the world will save one child’s life it’s worth it. Oh, and repeal Obamacare because it’s not in the CONSTITUTION! This page reminds me of the daily show.